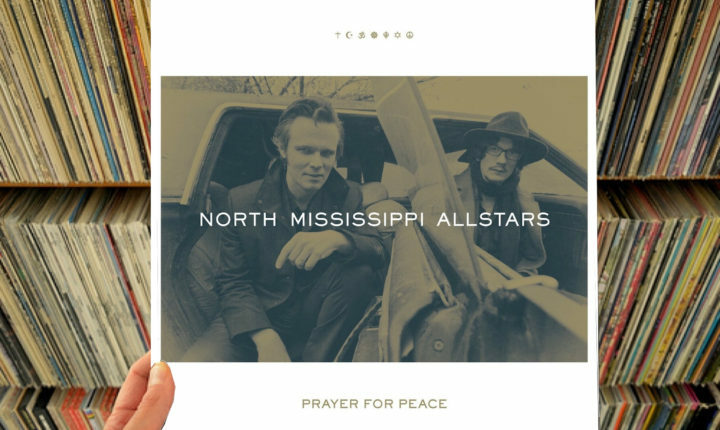 A deeper look at the grooves pressed into the Prayer For Peace LP by North Mississippi Allstars. The terms and conditions for being regarded as an “artistic dynasty” are vague and often vary from band-to-band but, without question or argument, the Dickinson family fits the bill. First, there was Jim Dickinson; for forty-six years, Jim Dickinson was present in one capacity or another (either as an “artist” or as a “producer”) to help realize some of the greatest blues albums of the second half of the twentieth century. On top of that, Jim’s sons Luther and Cody (also known as the creative backbone in North Mississippi Allstars) have been present to make some critically revered blues albums in their own right; having worked with the likes of Jon Spencer, The Black Crowes, The Replacements, Lucero and more – in addition to releasing their own records too. Simply said, both the blues and rock n’ Roll as they exist in the twenty-first century would not look at all the way they do without the Dickinson family. Perhaps it is for that reason Cody and Luther elected to let the tape roll on and capture the music found on Prayer For Peace – an album of cover songs by artists including R.L. Burnside, Will Slade and Fred McDowell, with a couple of re-thought, older originals included for good measure. The title track opens Prayer For Peace, appropriately enough, with a very prescient warning – particularly when one considers the sorry state of American politics in 2017 as Luther Dickinson worriedly offers up the words, “Look back on the crossroads seen in our grandfathers’ lives/ A change has come and gone” before beginning to moan worriedly. For some listeners, the words will come as telling; some will say that the end of the “American Century” has characterized itself as a trainwreck of botched ambition and, with a billionaire trying desperately to take the country back to war, all the common men and women can really do is cross themselves and “Pray For Peace.” Conversely, other listeners will simply be drawn in by the band’s understated performance of the song and its deep south blues guitar mastery. Regardless, no one will be able to deny the sly workings of the song – they’ll all be aboard by the time Dickinson begins name-checking different cities in an effort to call everyone within earshot together to join the prayer. By the time the singer invokes the ghost of Martin Luther King in hopes that he might be able to channel that spirit so we can know what the good doctor might think, the song will already be in its twilight which means no answer will be left but, by then, it won’t matter; by then, Dickinson will have already made his point (We’re in trouble, and it’s three feet high and rising) so all that really needs to happen is that the band needs to add its punctuation mark and move on. They do, and that’s the spell, cast; at the conclusion of “Prayer For Peace,” the brothers Dickinson will have listeners ready to hang on every word and every note – they may have paid the penny, but they’ll be in for the pound. …And do those listeners ever get more than a pound as soon as “Prayer For Peace” lets out. Immediately after the title track, “We Need TO Be Free” walks out and wallops listeners with a bag of southern fried guitar tone with no small amount of girth, and does it with the stomp and swagger of the seasoned veterans that the band knows they are. The volume increase between tracks one and two is pretty staggering; listeners won’t be taken aback by the difference, but they’ll certainly do a double take as the drums come near to clipping and the guitars do the same. Here,the Dickinson brothers go for broke as they let their guitars wail and the drums thunder, and the vocal rides atop it all smoothly and sweetly. The romance of that design and delivery is absolute and, just to prove they know what it is they’re doing exactly, they ride that form as they also drink muddy water (in “Miss Maybelle”), dare speedy escapes (“Run Red Rooster”) and then search for fast women and redemption from all their sins (yes, they go together here) at “Deep Ellum” to end out the side. When that happens, listeners may actually find they feel shorted by the experience; they’ll want more, they’ll just assume there would be more. They’ll feel gratified that there is indeed a B-side, but that doesn’t mean they won’t feel surprised that the A-side has already reached its turning point. The B-side effortlessly salves the surprise left by the end of “Deep Ellum” with the help of some I/IV/V and a dig through “Bird Without A Feather.” There, the brothers Dickinson reach into their box of standard and dust off a crunch R.L. Burnside cover, and really pull listeners into the moment by letting the chord progression breathe. It is often said that the most important thing in rock is remembering which notes shouldn’t be played , and that adage is upheld masterfully here; again living in clip, the guitars, bass and drums threaten to maul listeners, and the only thing which stops that from happening is the interference offered by Luther Dickinson on the mic. He proves to be the shepherd who gets listeners through this cover unscathed, and then is also the one who teaches then to two-step through the cover of Fred McDowell’s “You Got To Move.” On an already bright and brilliant run, “Bird Without A Feather” and “You Got To Move” are particular highlights – so much so, in fact, that the last three songs on the B-side almost feel like an extended denouement. That is not to say any of the last three songs on the B-side are throwaway numbers (quite the opposite), just that the slightly lower energy levels are apparent as the record progresses as a whole. Prayer For Peace is out now. Buy it here on Amazon.